When vacationers leave the beach, they often end up throwing away unused food. But a program that started last month called Second Helping collects unwanted food and donates it to local food pantries. It’s peak time for vacation season at the beach. And now a new program is collecting leftover food from vacationers as they exit the Crystal Coast. Mikel Peterson has more. 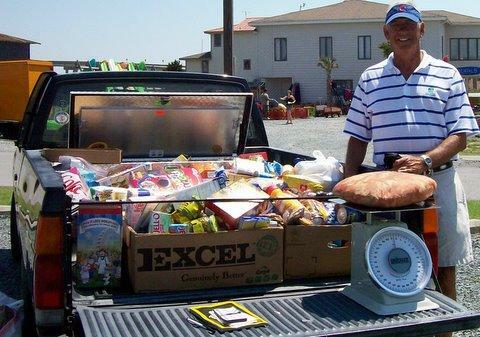 Beachgoers visiting Emerald Isle now have an alternative to throwing out leftover groceries. A new program called Second Helping is collecting those supplies for the White Oak Ministries food bank. Second Helping accepts perishables and non-perishables items in fact; they even accept already opened containers. Second Helping George Gardner got the idea from a similar program successful at Holden Beach for the last eight years. Gardner started the planning process of becoming a community supported project last fall. Second Helping set up roadside stands and accepts food from tourist as they are passing by. Their stands in Emerald Isle are operational on Saturdays, 7am-noon, from now through Labor Day weekend. The inaugural collection event, 3 weeks ago, saw a variety of donated items: a half carton of eggs, doughnuts, popsicles, canned goods and lots of bread. A week later, Second Helping started collecting dog and cat food. And now, Gardner says they’ll accept non-food items as well. Gardner says he’s been in contact with the other food pantries in Carteret County, Martha's Mission in Morehead City, Hope Mission in Morehead City, and Caroline's House in Morehead City to let them know about the Emerald Isle program. Second Helping is also in need of volunteers to help out with collections on Saturdays. So far the program only has 8 volunteers. Since the community supported project is getting off the ground, Gardner says they’re trying to get the word out to tourist about their mission to help feed the hungry. As for the future of Second Helping, Gardner hopes to expand the program next year to include Atlantic Beach. For more information visit asecondhelping-emeraldisle.com. I’m Mikel Peterson.